Piano music by Arnold Bax and Harriet Cohen. 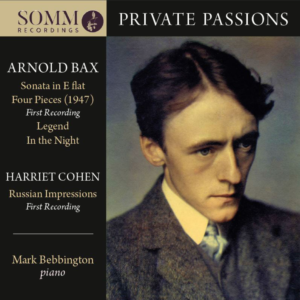 Private Passions is well named, not only because of the amorous bond between the album’s two composers, but also because so much of Bax’s music was inspired by his lover, muse, champion and later Guardian of the Flame, the pianist Harriet Cohen. As Graham Parlett’s illuminating notes reveal, much of the programme reflects this special relationship; and from the arresting, combative first phrase of the Sonata in E flat, we know that we’re getting something equally special in the execution. Over the years SOMM’s ‘house pianist’ Mark Bebbington has grown into an artist transcending locality, but I dare say that nowhere has his mastery been more evident than in this fascinating collection of rarities. Mastery is certainly needed to tackle the 1921 Sonata in E flat, withdrawn in manuscript and orchestrated by the composer as his heaven-storming Symphony No.1. If previous, distinguished CD performances (from John McCabe and Michael Endres) have drawn attention to that orchestral scope and scale, Bebbington’s achievement – aided by an intimate, rich recording engineered by Paul Arden-Taylor at Birmingham’s CBSO Centre – is to make the music sound convincingly pianistic, very much in the Lisztian vein of its predecessor the 2nd Sonata. Bax himself had recognised the soloistic nature of the nocturnal slow movement, with its pearl-drop arpeggios, ritualistic melody and obsessive figuration, by writing a completely new movement for the Symphony. Bebbington’s touch and natural rubato are very satisfying here, but even more impressive is his controlled yet passionate phrasing in the tempestuous first movement, where he makes everything in Bax’s welter of notes count, just as he quarries the death’s-head humour of the grim Scherzo-Finale. In sum this is a tremendous performance, which – in case anyone still doubted it – confirms that the E flat deserves to take its place at the heart of Bax’s four, officially numbered sonatas. Of equal interest to Baxians will be the premiere recording of the Four Pieces from 1947. There’s plenty of contrast in the 18-minute set, from the unusually bitter, militaristic satire of the Fantastic March with its faintly jazzy trio (perhaps, as Parlett suggests, reflecting the composer’s impatience with his official duties as Master of the King’s Music!) to the stormy final Phantasie, by way of a wistful Romanza and the watercolour sketch of the Idyll. If the quality of Bax’s melodic invention was no longer at full flow after the war years, Bebbington’s artistry and imagination do everything they can to bring out the music’s formal and harmonic appeal. Given Bax’s unfailing ability to conjure specific moods, the Four Pieces are something of a find. Bebbington brings the same sterling advocacy to the 1935 Legend (alone here in being inspired by the pianism of someone other than Cohen, the Australian John Simons) and most marvellously to the gorgeous passacaglia In the Night, which dates from 1914. This does seem to have been something in the way of a private gift to Harriet Cohen, who loved its “dreamy and tranquil” opening, which builds to a blazing fortissimo climax before sinking slowly back into the dark land of dreams. Bebbington’s consummate poetry and subdued colours eclipse the work’s sole previous outing, on a Chandos disc with Eric Parkin. Strangely, the only pieces here to be published in their own time were Cohen’s four, brief Russian Impressions, and I wish I could report that they were better than pleasant makeweights. I’m glad to have heard this first recording, but nothing in these derivative, oddly directionless miniatures made me eager to revisit Cohen the composer. As Germaine Greer puts it, mediocrity is mediocrity, even where its creator is female. Let’s be grateful that Harriet Cohen’s magnetic artistry and personality gave birth to Bax’s remarkable musical world, and that Mark Bebbington has brought some of their obscurer riches into the light of day. This is truly a disc to treasure. Bax: Sonata in E flat major; In the Night (Passacaglia); Four Pieces (Fantastic March, Romanza, Idyll, Phantasie); Legend.